A year or so ago, a prof who was cleaning out overflowing bookshelves passed along several volumes in the “Case Studies in Contemporary Criticism” series, published by Bedford St. Martin. This series includes the entire text of some ‘canonical’ work, then introduces a student to several types of criticism with a four-to-five page description of the foundations and major concerns of each type of criticism and an academic article utilizing that type of criticism to investigate the work. 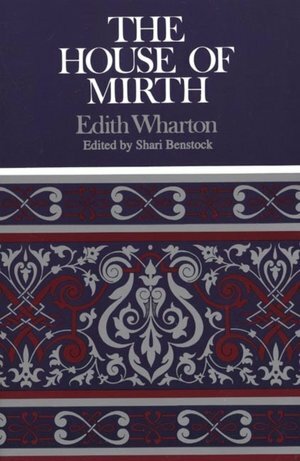 And so, as I began my immersion in all things Wharton this month, I selected my copy of The House of Mirth for my introductory read. I loved the book. I sympathized with Lily, though I kind of despised some of her decisions. Her movement through the novel is like this inexorable slide from respectability to utter bleakness. She keeps sabotaging herself: at a pivotal moment, she blows off an appointment with the eminently suitable (though dull) suitor whom she has been chasing all weekend, allowing a horror of a fellow guest to poison his mind against her; she (possibly nobly, but still) refuses to use the letters that have fallen into her hand which would have rectified her social (and thus economic) difficulties; she basically just makes really short-sighted decisions regarding some of the characters who very obviously don’t have her interests at heart. Although she seems to be so fitted for the society life, she is repeatedly unable to manage the negotiations that are necessary. I thought it interesting that Lily herself mourns her dead mother specifically because she would have managed those negotiations for her. Much of the personal history that Lily recounts doesn’t exactly endear her deceased mother to the reader, especially to a reader that doesn’t place quite the same value on “society life” as Mrs. Bart. Lily doesn’t really question the values she’s been given. She’s unable to really live up to them–her mother, certainly, would never have let Percy Gryce get away–but she never really finds an alternate set of values. I think this tension between the older and the younger generation–specifically women in the older and younger generation–is one of the things that makes this novel so readable. The mother/daughter relationship is famously fraught with tension. Even when the daughter (like Lily) is trying to live as her mother would have wished, it’s impossible to completely translate the values of one generation to another. (At least, it is now, since social change is rampant. I wonder if in a more static time–say the 1500’s or so–the younger generation had less trouble with this?) Of course, as Phyllis Chesler points out (in her absolutely wonderful book Women and Madness) mothers, to protect their daughters from the punishments meted out to those who break the social codes, become responsible for molding their daughters into the structure of patriarchy. So the restrictions of patriarchy are blamed, illogically perhaps, on the enforcer of those restrictions–the mother. So all those fights about your clothes? She was trying to help. Probably. This generational tension is especially important, as the most true moment in the novel seems to be the meeting between Lily and Nettie, the charity case whom she’d helped during more solvent times, and later Lily’s meeting of Nettie’s infant daughter, Lily. In observing that mother/daughter relationship, Lily feels a “surprised sense of human fellowship that took the mortal chill from her heart.” Later, as she lies dying (sorry about the spoiler), she imagines the weight of the child’s head on her arm and is comforted. There’s kind of a weird tension in the episode at Nettie’s home. Lily is attracted and comforted by the domestic scene, but afraid of tainting it: when Nettie expresses a wish that her daughter Lily might grow up to be just like Lily Bart, fashionable and smart, Lily is horrified by the suggestion and quickly departs. This is really the only place that I could locate an implicit rejection of her mother’s value system. She’s afraid her very presence–her priorities, her objectives–will ruin the innocent child’s chances of a happy life. So, that’s all what I got from the book. But then I kept flipping through the rest of the book, through all the criticism, and I found all of these other insanely brilliant insights that I completely missed. I love a good academic article–it’s like being in a book club with really smart people, or being in a literature class with others who actually did the homework. (An all too rare occurrence. I can’t wait for grad school. You may remind me of this in six months, when I’m exhausted, but for now I’m just really really excited.) It’s intoxicating. If I read, say, The Woman in White, I’ll likely focus on the role of the asylum and incarceration in the subjugation of women. If you read The Woman in White, maybe you’ll have all of these really fascinating thoughts about the first person narrator and limited consciousness. Both of our readings are “correct” in that both are predicated upon material that is actually in the text. But in talking to you about your first-person narrative obsession, I’m going to learn all of these fascinating things that I missed while focusing on my locked doors. And that’s what an academic article does: it takes the text and shows you things you missed. I think the most compelling article–or at least the one that most changed my thinking about the novel– is Wai-chee Dimock’s critique: “Debasing Exchange: Edith Wharton’s The House of Mirth.” Dimock focuses on the constant dialogue of the marketplace in the novel. Money (the getting, the keeping, the losing) occupies a central role, but even the exchanges that aren’t obviously financial are spoken of in such terms. “Worth” and “ruin” and “assets” and “speculation” are used to discuss reputations and beauty and social obligations. Dimock then points out that using the marketplace as a metaphor implies a logical and stable underlying structure of society which, in fact, is false. For example, Lily’s financial situation becomes truly dire when Lily asks Gus Trenor to invest her inadequate stipend. Instead, unbeknownst to her, he gives her the money, attributing the sums to clever investments. Lily thinks the exchange is minor–allowing him to lean a little closer in exchange for the use of his knowledge-base–but he is actually paying her for undefined, and thus impossible to measure, “favors”. Lily knows she must repay Gus in kind, money for money, because there is no way to measure when the other sort of payment, the payment that Gus expects and desires, will be complete. The marketplace, as applied to social situations, is “not computable on an absolute scale.” “Lily ‘owes’ [Gus] Trenor the payment that he now demands only according to his rate of exchange–not hers–and his ability to set the rate and impose it on Lily says nothing about fairness, only something about power” (Dimock 377). Dimock then points out that in refusing to accept the construction that Gus puts on the money (that which buys favors), Lily regains the power. “By paying back the exact monetary amount, by equating nine thousand dollars with nine thousand dollars, Lily at once obeys the principle of exchange and reduces it to a tautology. …by making money its own equivalent, Lily reduces it to its own terms and defies its purchasing power” (383). How awesome is that? 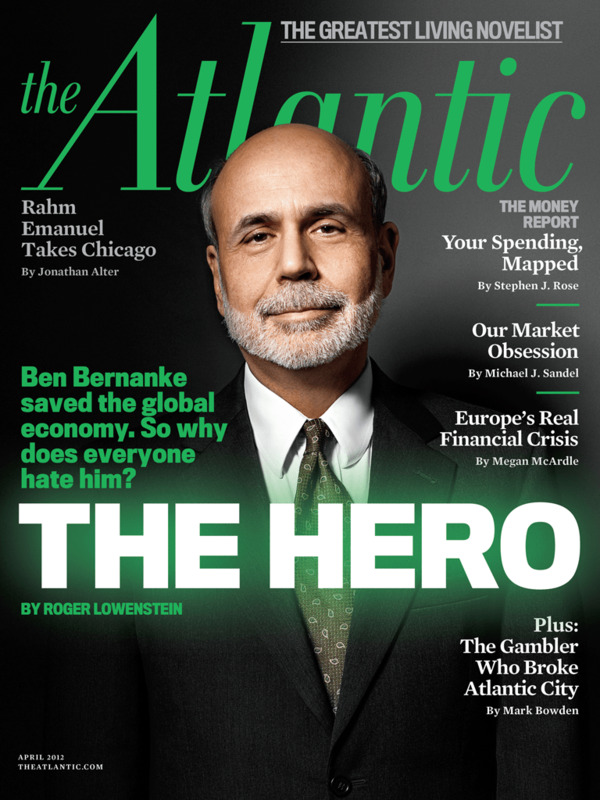 And then, as I was mulling over all of this fascinating stuff about rates of exchange in The House of Mirth, this month’s The Atlantic was delivered. And it’s all about money. Seriously. The subtitle for the edition is “The Money Report.” I found most interesting the article “What Isn’t for Sale?” by Michael J. Sandel, a political philosopher at Harvard and the author of a book entitled What Money Can’t Buy: The Moral Limits of Markets, from which the article was adapted. Anyway, Sandel begins by pointing out several of the ways in which the market has encroached upon our daily lives: you can sell space on your forehead to advertisers; you can upgrade to a better jail cell; you can buy a surrogate mother; you can buy the right to emit pollutants. And then he draws some conclusions about our marketcentric society. In its own way, market reasoning empties public life of moral argument…it has drained public discourse of moral and civic energy, and contributed to the technocratic, managerial politics afflicting many societies today. This all seemed especially applicable, not only to our society, about which Sandell insightfully talks, but also about the market society portrayed in The House of Mirth. As Dimock (the critic up a few paragraphs) pointed out, social negotiations and obligations are reduced to financial transactions, which, I think, is why Lily finds peace in the domestic vision of the poverty-stricken Nettie. Oh. I loved the book. Did I mention?